New Look 6092 Corset top and skirt pattern in sizes 3/4 – 13/14. Corset style top has shoulder straps, halter or strapless with lacing up the back. Skirt has a back godet insert. Pattern is new, uncut, factory folded and complete with instructions. Note: Envelope may be crinkled at edges, contain small tears and/or shelf wear that does not affect the tissue pattern. 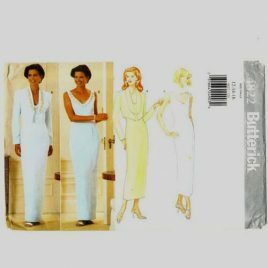 Butterick 4822 floor or tea length evening dress with short jacket in sizes 12-14-16. 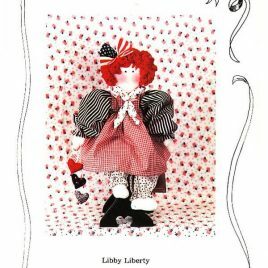 Cute cloth doll pattern to make a 17" rag doll in muslin with patriotic clothes. Uncut. Butterick 4556 Plus Size top sewing pattern sizes 18W - 24W. 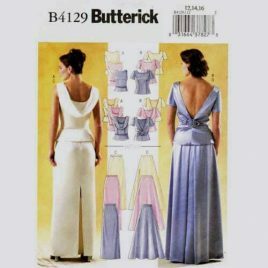 Butterick 4129 low back evening gown top and skirt pattern in sizes 12-14-16.